Water towers- one of my favorite photo books of all time! A true celebration of the individual. another grievous loss for the photographic community..i also would like to convey my sympathy to Frau Becher. Their relationship had to be truly amazing to work so brilliantly on so many levels. 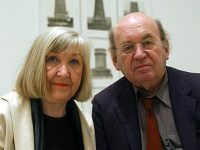 Their contributions to the art world are legendary..He will be missed by all.. Thank you for passing that on, Mike. That is really sad news and I am very shocked. I was not immediately taken with their work (which was usually seen in introductions to books on other photographers) but the beauty of their work soon crept up on me. 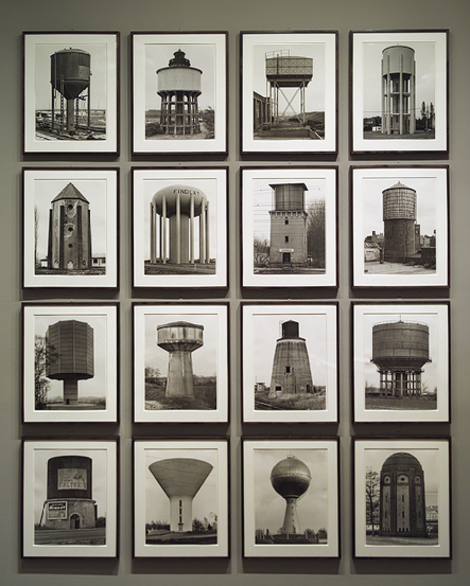 The dedication is amazing - when you see works titled, for example, "Watertowers: 1967 - 1980" it really sinks in. Thirteen years spent seeking out new examples. Always taking photographs form the same aspect in the conditions. Truly inspiring. They crop up so often in books that it sometimes seems as if they were almost singlehandedly responsible for the state of contemporary photography. You mention Gursky, but they also taught Candida Hofer, Thomas Struth, Thomas Ruff. Incredible influence and an incredible man. That their students' work is so successful and yet so different from their own is a fine testament to them as teachers. I live in Düsseldorf and was also very sad to hear about Bernd Becher's death. I have always been very impressed by the art of Bernd und Hilla Becher and liked their photographs of mineheads most. I saw their exibition in the Düsseldorf museum K 21 a few years ago. Muito boas as fotos, um grande estímulo para mim, que faço um tipo de fotos com a natureza.